The 10ft Black Sky Dancer attachment is the 10ft inflatable advertising product from Balloon Man. This 10ft Sky Dancer attachment pops out against any background and in any environment. The deep rich Black is sure to provide more contrast to the existing color scheme of your business or event. This Sky Dancer also looks great paired or in groups with all other colored Sky Dancers. Order your 10ft Black Sky Dancer today and let it show you what your business or event is capable of achieving. 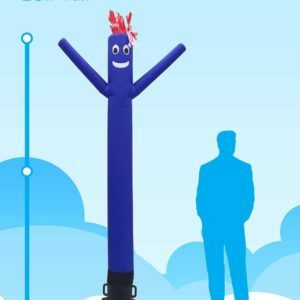 The 10ft Blue Sky Dancer attachment is the inflatable advertising product that will set apart your business or event from the rest of the block. 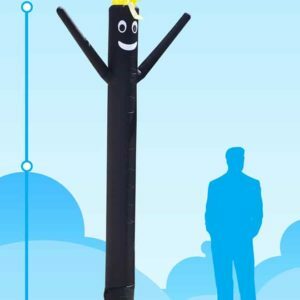 For those who want the same impact as our classic 20ft Blue Sky Dancer but in a compact size, the 10ft height and attractive color and face is ideal for space restricted areas and will attract much needed traffic. Stay ahead of your neighbors by purchasing an inflatable advertising product from Balloon Man. 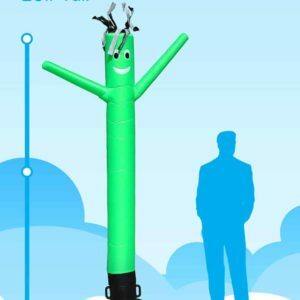 The 10ft Green Sky Dancer attachment is the 10ft inflatable advertising product from balloon Man that will give more color and attraction to your business or event. Whether you need a boost in foot traffic or sales numbers, the bright green color, friendly face, waving arms, and dancing body will be sure to impact all that pass by. This green colored Sky Dancer will help you stand apart from your neighbors on the block. Combine with the required SkyDancers.com 12" blower and be ready to create higher revenue and attract more traffic within minutes! Blower sold seperately. The 10ft Orange Sky Dancer attachment is the 10ft inflatable advertising product that you need to get those extra patrons to visit your establishment. 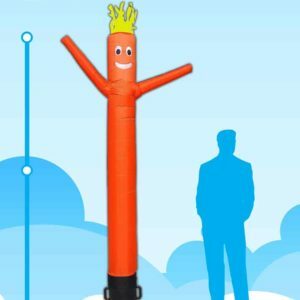 The same as our classic 20ft Sky Dancer but in a more compact size, this 10ft Orange Sky Dancer attachment from Balloon Man will attract with it's smiling face, dancing motion, and bright color. Your customers will be amazed at the inflatable advertising product from Skydancers.com. Pair this attachment up with the required SkyDancers.com 12" diameter blower, and you'll be up and running within minutes. Blower sold seperately. The 10ft Pink Sky Dancer attachment is the 10ft inflatable advertising product from Balloon Man that will give more color and attraction to your business or event. Whether you need a boost in foot traffic or sales numbers, the bright pink color, friendly face, waving arms, and dancing body will be sure to impact all that pass by. This pink colored Sky Dancer will help you stand apart from your neighbors on the block. Combine with the required 12" blower and be ready to create higher revenue and attract more traffic within minutes! Blower sold seperately. 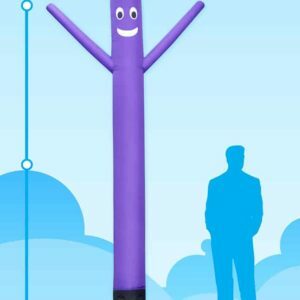 The 10ft Purple Sky Dancer attachment is the 10ft inflatable advertising product from Balloon Man. The clean crisp Purple that will shine in any environment and against any background. Pair it with another Sky Dancer to provide a nice color contrast to your existing advertising for your business or event. Built from the highest quality material with the same high standard production methods as the rest of our Sky Dancers, you'll be glad you ordered the 10ft Purple Sky Dancer from Balloonman.ie Blower sold seperately. 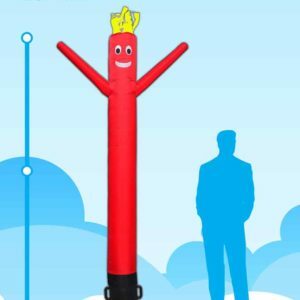 The 10ft Red Sky Dancer attachment is an inflatable advertising product that will catch the eye of your patrons with it's dancing and waving, enticing them to visit your business or event. For those who want the same impact as our classic 20ft Red Sky Dancer but in a compact size, the 10ft height and attractive color and face is ideal for space restricted areas and will attract much needed traffic. Stay ahead of the competition by purchasing an inflatable advertising product from Balloon Man. Blower sold seperately. 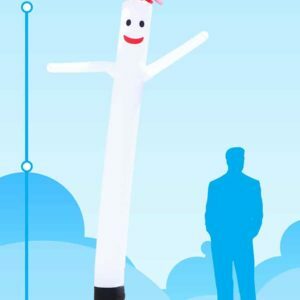 The 10ft White Sky Dancer attachment is the 10ft inflatable advertising product from Balloon man. The clean crisp White that will shine in any environment and against any background. Pair it with the SkyDancers.com 10ft Black dancer or any other color to provide a nice color contrast to your existing advertising for your business or event. Built from the highest quality material with the same high standard production methods as the rest of our Sky Dancers, you'll be glad you ordered the 10ft White Sky Dancer from Balloonman.ie Blower sold seperately. The 10ft Yellow Sky Dancer attachment is the 10ft inflatable advertising product that will set apart your business or event from the rest of the block. 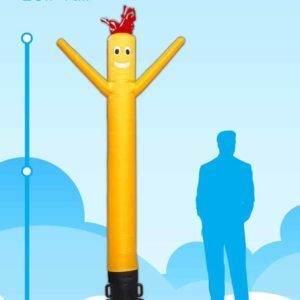 With the same impact of our classic 20ft Sky Dancer but in a more compact size, this 10ft Yellow Sky Dancer attachment from Balloon Man will create curiosity when they see it's smiling face, dancing motion, and bright color. Stay ahead of your neighbors by purchasing an inflatable advertising product from Balloonman.ie Blower sold seperately.